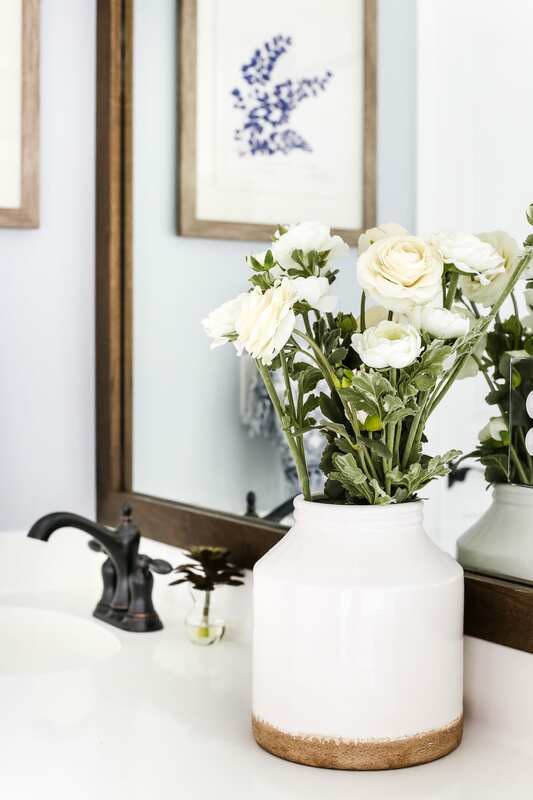 A team of 6 DIYers take on a bathroom makeover in 48 hours to transform a plain, builder grade space to give it character and modern farmhouse charm. Thank you to Lowe’s for sponsoring this post. As always, opinions and content are my own. This post makes me want to scream from the rooftops, y’all! I’ve been bursting at the seams to share a BIG room makeover that we’ve been keeping a little secret about. 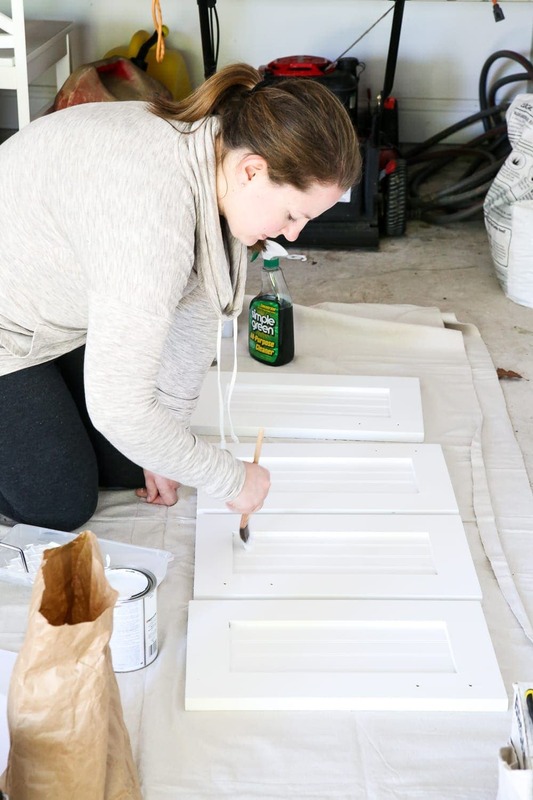 If you remember way back a few months ago, I announced that I was teaming up with Lowe’s for a makeover in someone’s home anywhere in the United States. There were so many great contenders who submitted their kitchens, bathrooms, and outdoor spaces that had tons of potential. I wish we could have given makeovers to all of them! The homeowners’ story stuck with me. Bethany and Levi shared how they have been married for 7 years and live in a suburban builder grade house right next door to Levi’s family. 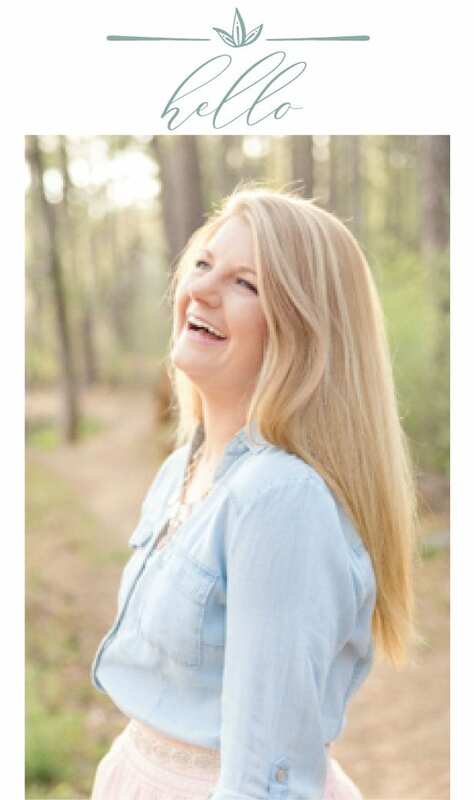 Bethany just graduated and works as a mental health counselor intern, while Levi is a wedding videographer and drummer in a worship band. Funds for home improvement don’t come easily. They love hosting friends and family in their home and talk to their dog and two cats like they’re their children (and uh… guilty! I do that too). Something about them just reminded me so much of Robert’s and my story. 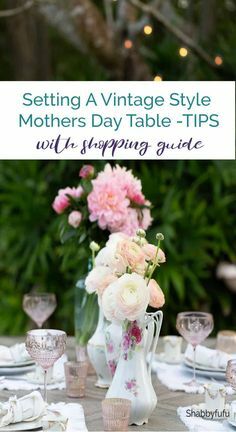 Back in April, after lots of planning and preparing, Robert and I flew out to their home along with an incredibly talented team of bloggers: Rachel from Maison de Pax, Jenna from Rain on a Tin Roof, Nina from Nina Hendrick Design, and April from House By Hoff. And we had two days to flip this space. Totally doable, right? The room had good bones, and we had to keep time constraints in mind to make it all happen. 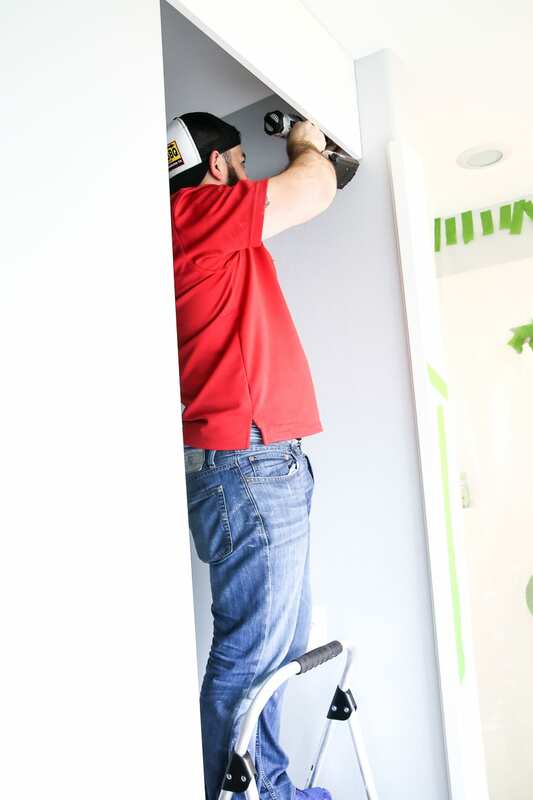 Robert and I (and the rest of our team) are not contractors with a wide array of skill sets, but giving a room wow-factor sometimes only needs mostly non-demo cosmetic changes. And this bathroom had that potential. One of the big issues was Bethany and Levi’s shower door, which was cloudy and rusted to the point where it wouldn’t even close all the way. So the first task on the agenda was to rip it all out along with the faucets and light fixtures (okay, so maybe there was a little demo). I’m not sure if this is Robert’s excited face or scared face, or maybe a little of both. Ha! 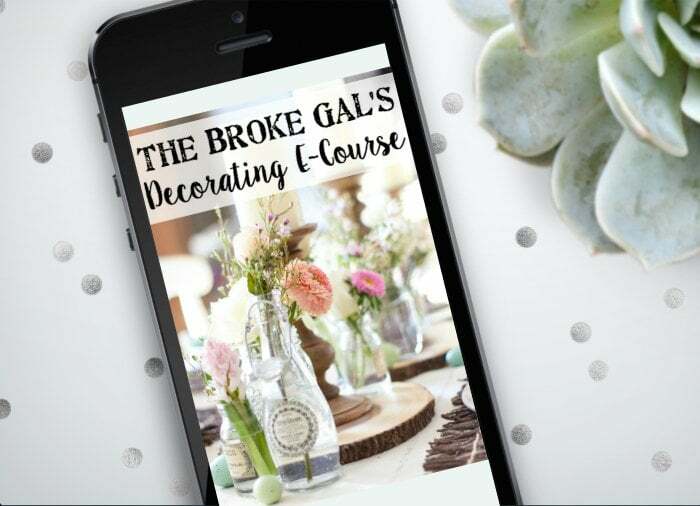 There were so many projects that went awry in this makeover, and we were all constantly problem solving to make it work. But I could not have asked for a better team. It was MAJOR girl power all weekend, plus Robert’s muscle. Poor guy got a big workout in those two days with 5 women hustling around, but he’s always a good sport. And despite all of the stress and hard work to get it done, we had a lot of fun and a lot of laughs. Nina was the cabinet painting pro. 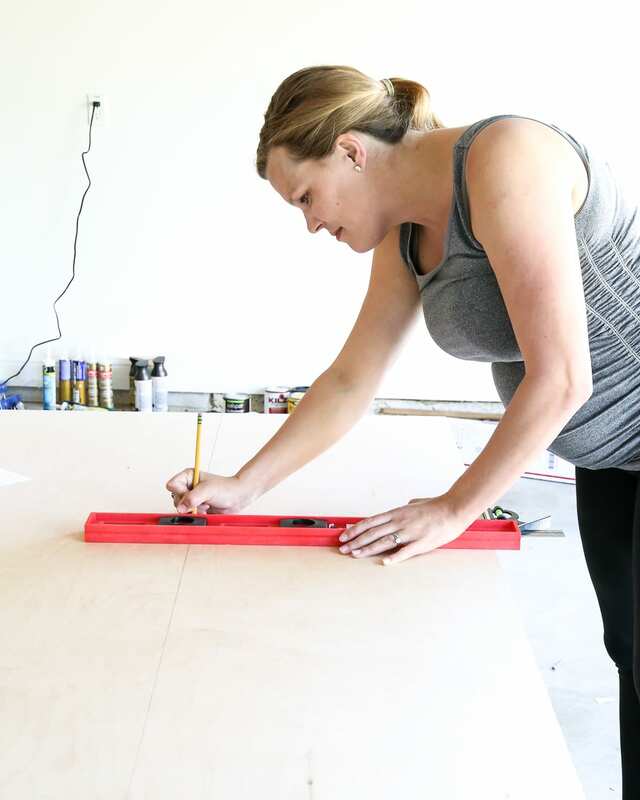 Rachel built a barn door and rigged two tracks while 8 months pregnant! 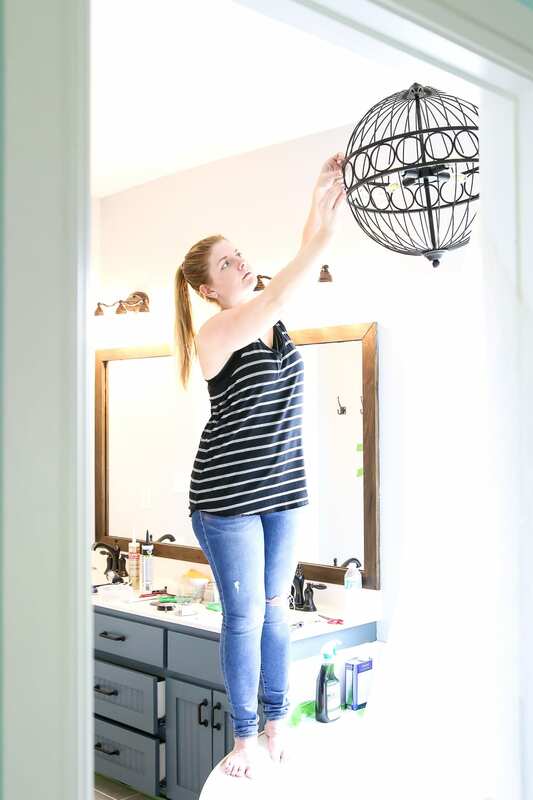 Jenna was on hardware duty most of the time putting in light fixtures, building a mirror frame, and installing cabinet pulls. And I ran around doing every odd job I could find… like balancing on a bathtub to wrestle with a chandelier. For every single project, there were multiple people pitching in. It was the biggest rush and best relief to see it all come together in the end. So remember that basic bathroom before? Bethany and Levi stayed out of their master bedroom and bathroom all weekend to be fully surprised, and it was the best feeling in the world to see their reactions. They were the absolute sweetest couple, and we couldn’t have asked for more welcoming hosts. 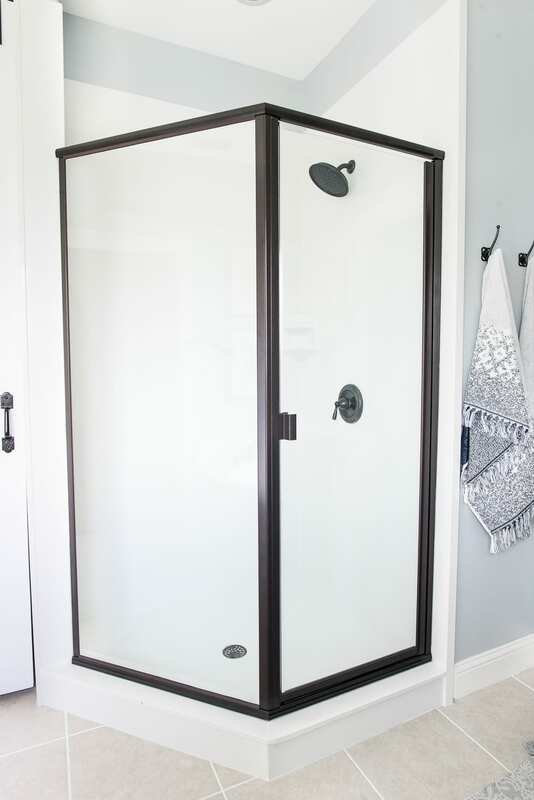 Their cloudy, rusted shower door got a full replacement and made a huge difference in this space! We chose oil-rubbed bronze to create contrast. 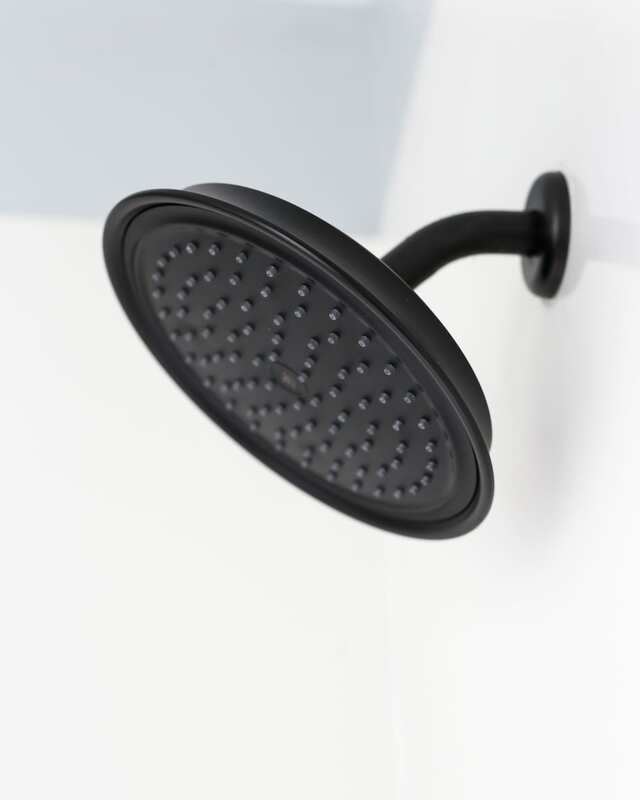 And the larger shower head makes it more of a spa-like experience. 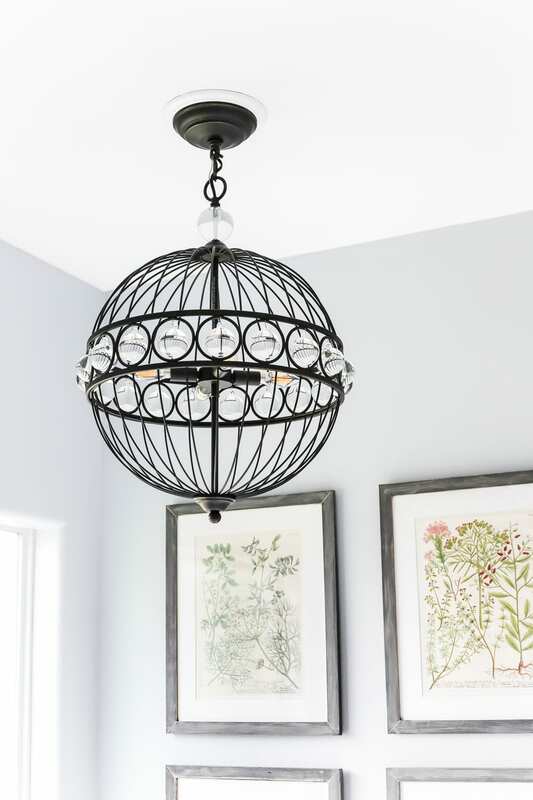 This chandelier is the perfect blend of glam and industrial for a feminine/masculine balance above their tub. 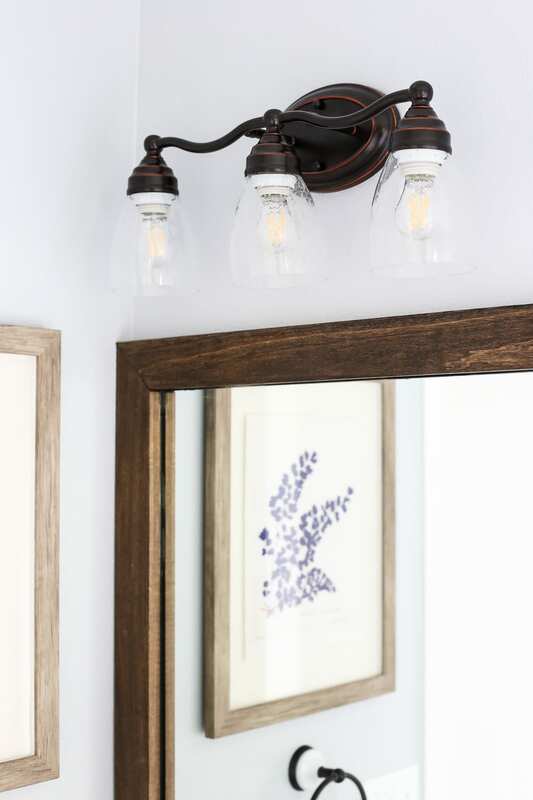 We swapped the old Hollywood style vanity light for these seeded glass bronze ones too. We also decided to paint the walls in Sherwin Williams Gray Screen for a light gray/blue to give the room a calming mood. To continue with the bronze finish and create contrast, we swapped the old pulls for these more industrial style ones. We left the builder grade mirror intact and framed it out with pine boards stained in Minwax Dark Walnut for a little touch of rustic. And to freshen up the tile floor, we painted the grout with Valspar Duramax paint in the color Du Jour for a quick, simple solution. 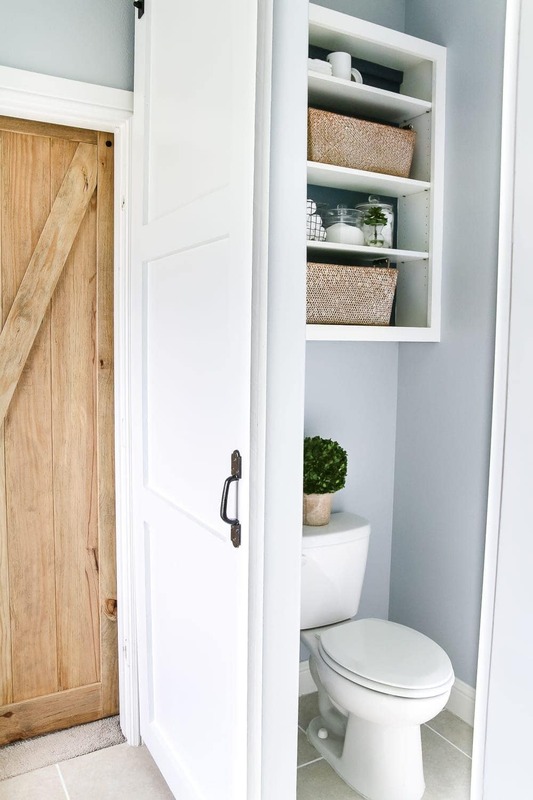 Since the water closet wasn’t really a water closet at all without a door, we built a barn door from scratch to fit the 9 foot opening and rigged a header for a sliding barn door track to make that corner more private and functional. 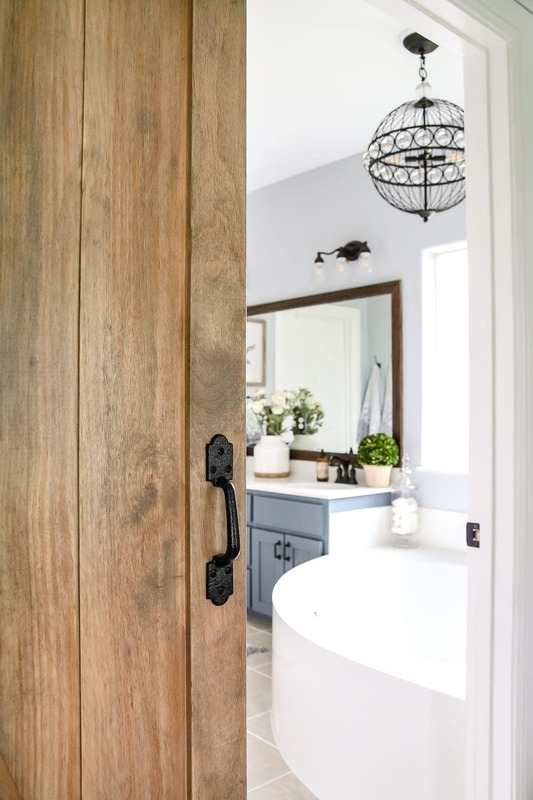 To help with traffic flow and to prevent the old bathroom door in the bedroom from slamming into the newly built barn door, we decided to use an unfinished barn door kit, stained it with Minwax Weathered Oak, sealed it with polyurethane to protect it from moisture, and hung it up on a sliding track. It added so much gorgeous texture but was equally functional too. 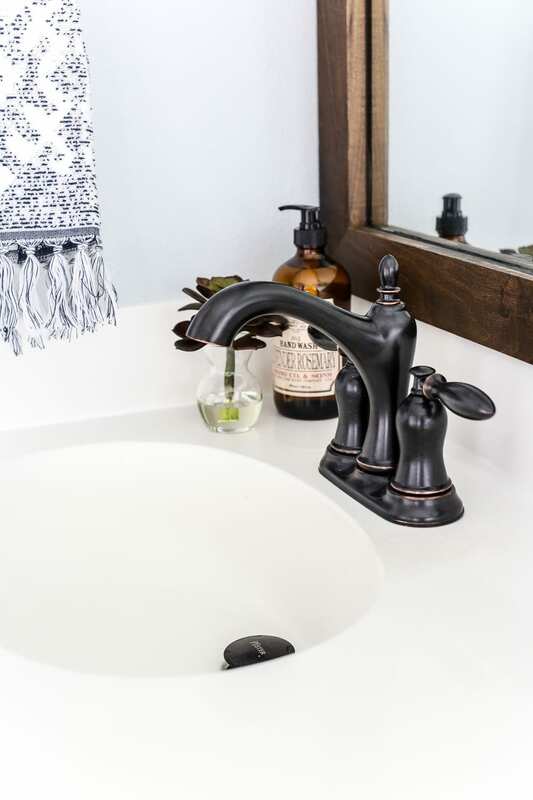 For the sink faucets, we installed these curvier bronze ones for a more feminine look on their existing white cultured countertop. 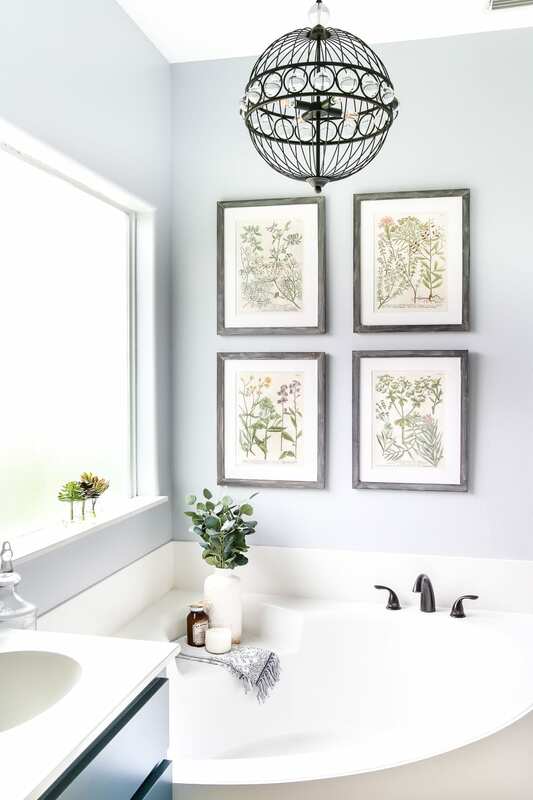 And to add some softness in contrast from the rugged wood and dark metal in the space, we hung up this set of botanical prints. They helped to balance that frosted window and filled up that odd blank wall. 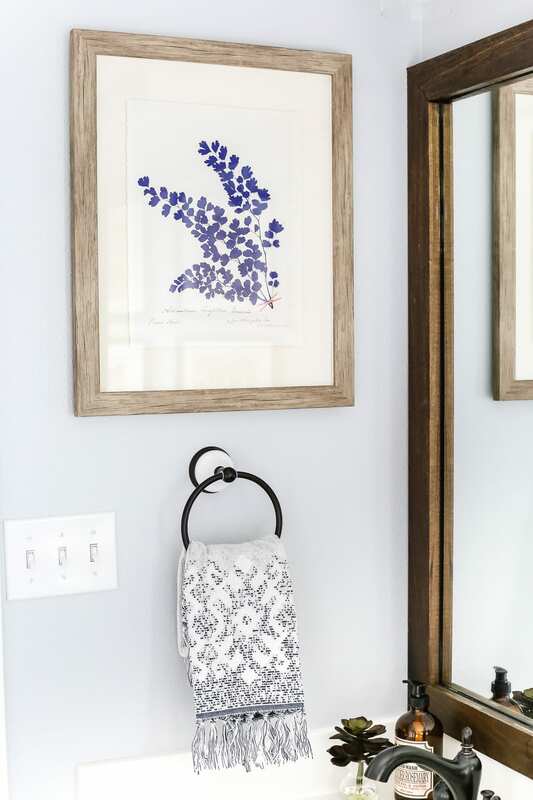 This pretty blue botanical print coordinated perfectly beside their vanity for a more modern spin on farmhouse art. 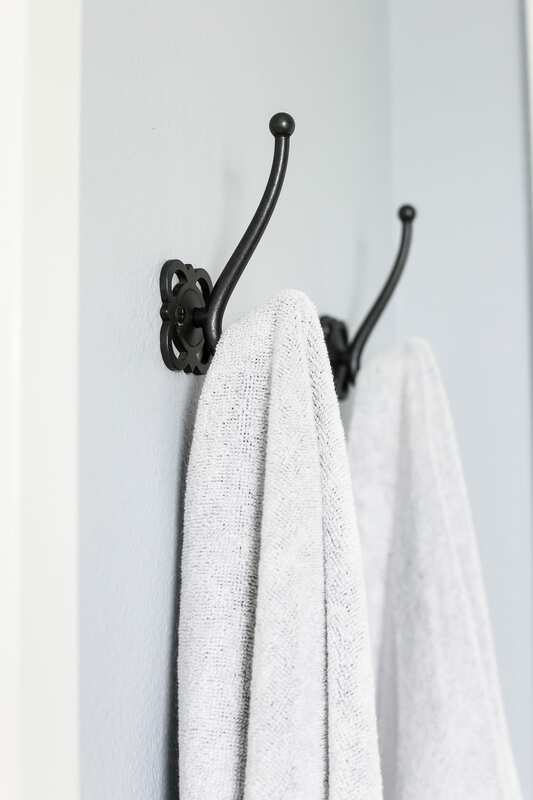 We threw in lots of organization and storage for making this bathroom super functional, like these hooks right beside the shower door. 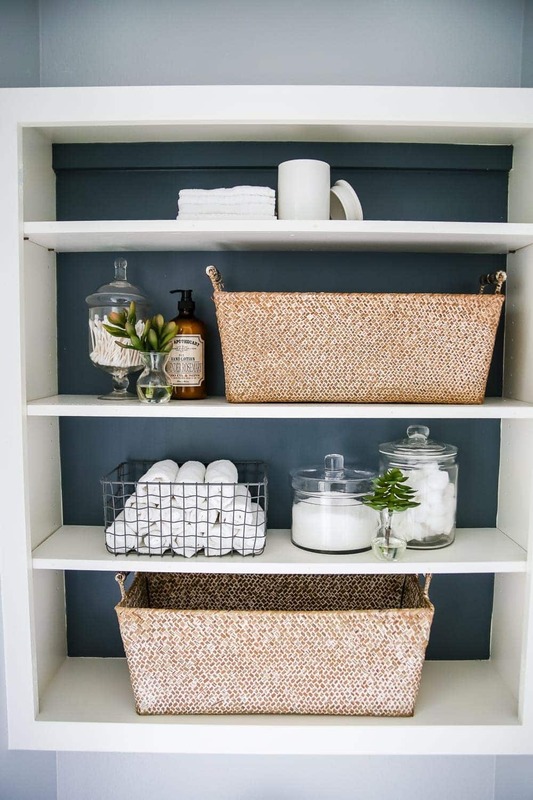 And in the water closet, above the toilet, we removed the existing cabinet doors to create open shelving filled with apothecary jars and baskets for toiletry items. 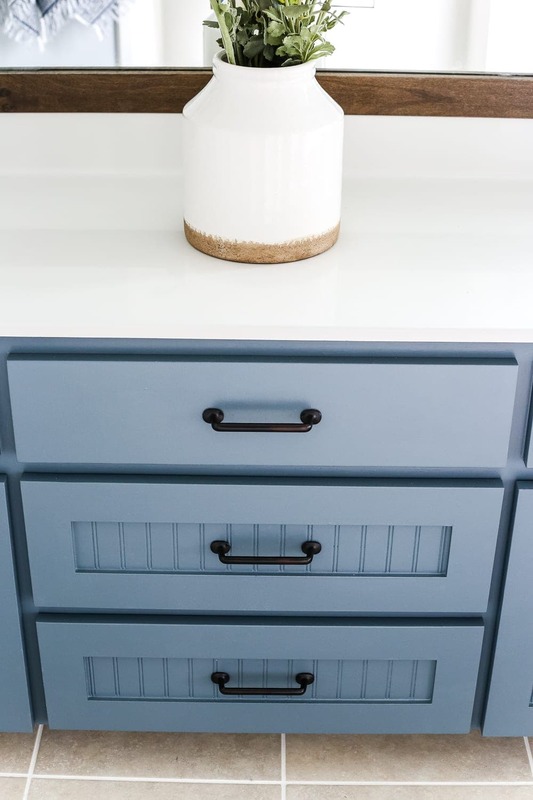 We painted the back of the cabinet the same color as the vanity cabinets to add some depth and tie in with the rest of the room. Once we added in faux succulents and silk flowers, this entire room sprung to life! Plants are magical like that. By incorporating plenty of natural textures like greenery, wood, woven baskets, delicate glass, and light textiles, the room took on so much charm. It was certainly not an easy job, and probably the most challenging project we’ve ever done, but every ounce of hard work and every bump in the road was so worth it. I feel incredibly blessed to be a part of it and am thrilled with how it all turned out. But most of all, I’m ecstatic that the homeowners love it just as much. They are so deserving of a space just for them where they can recharge and continue to bless others with their talents. I can’t end this post without a HUGE thank you to Lowe’s and to the incredible team who made it all possible. This entire project really is a proof that a basic builder grade space can have character with some hard work and imagination (and plenty of good ol’ teamwork). how lovely! I agree, the bathroom has a great big size, good bones! Again, always amazing what paint can do. And adding the “jewelry” of lighting, faucets, knobs gave this space a wonderful, clean, modern spin. They are lucky to have been chosen by your great team. It’s beautiful! I love the pretty blue hue you selected! Hi, what about the rug? Where is this from? Ahhh! Such fun memories! I still can’t believe we pulled that off in two-ish days! 🙂 The after looks so amazing! Wow – what a wonderful transformation! 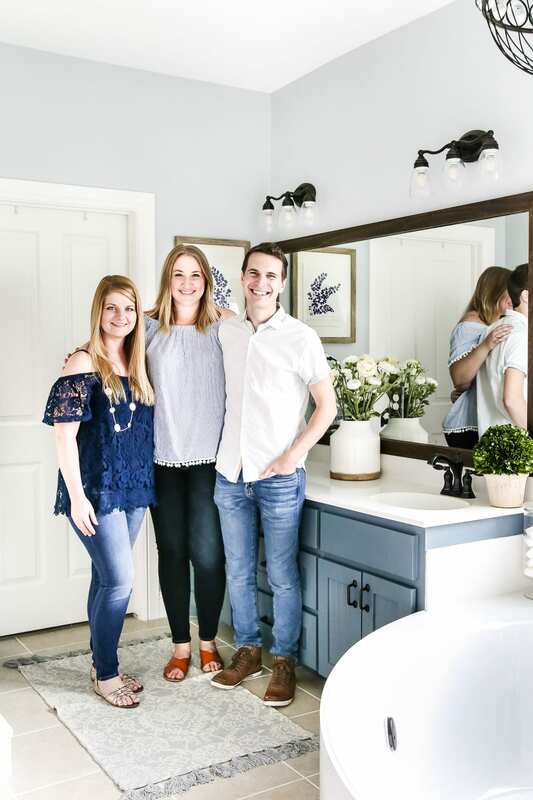 The homeowners were blessed to have such an amazing team to give their bathroom a totally new look. 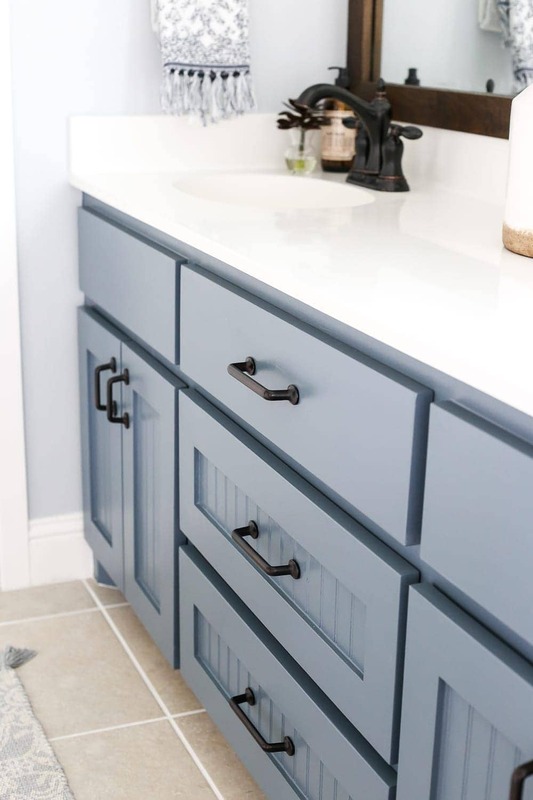 Love the color that the vanity was painted! Go team! Yall did such an amazing job, I feel so so lucky- thank you!!! This is the post I’ve been waiting on. You never disappoint! Looks so fresh and clean and updated. Love it! Well done! It’s not too anything, including gray, or overdone. It looks like it be lived in comfortably. I think I’ll use your idea combinations for my bathroom whenever we get to it. Oh that bathroom is gorgeous! You guys did a great job! Sometimes you don’t need major reno! I would love a big bathroom like that! Oh that tub! And I want a water closet! I love barn doors. Looks so good! I love the open shelving and barn doors. Wow! This turned out great! Love all the colors and accessories. Never knew you could paint grout. I will have to look that up. Great job everyone! WOW! What a difference! What brand of rug is that in front of the vanity? It looks absolutely incredible, Lauren!! You ladies (and Robert! 😉 did an amazing job!!! Lauren, you and Robert and the rest of the team did a great job! It’s just beautiful!! What an incredible transformation Lauren!! 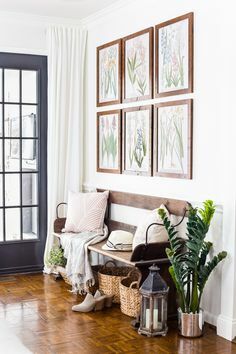 This space is a dream! 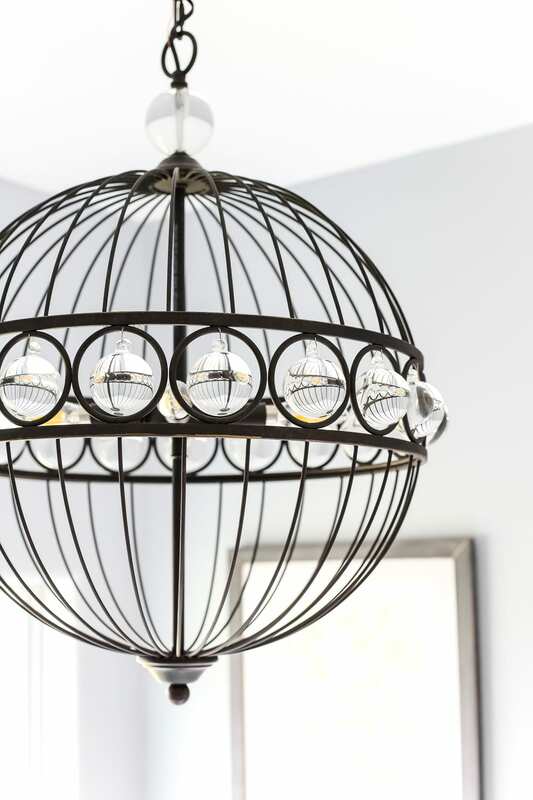 You’ve done an amazing job and that pendant light is so stunning! Love it all! Absolutely beautiful! Could you give info on the bathtub faucet? It appears silver/chrome in the before pics and bronze in the after pics Is there a special paint you can recoat existing fixtures with or did you replace it? Just seeing the additional link in your email – thank you! Beautiful! I love the shower door ? But I didn’t see a link to it? Love the makeover!!! 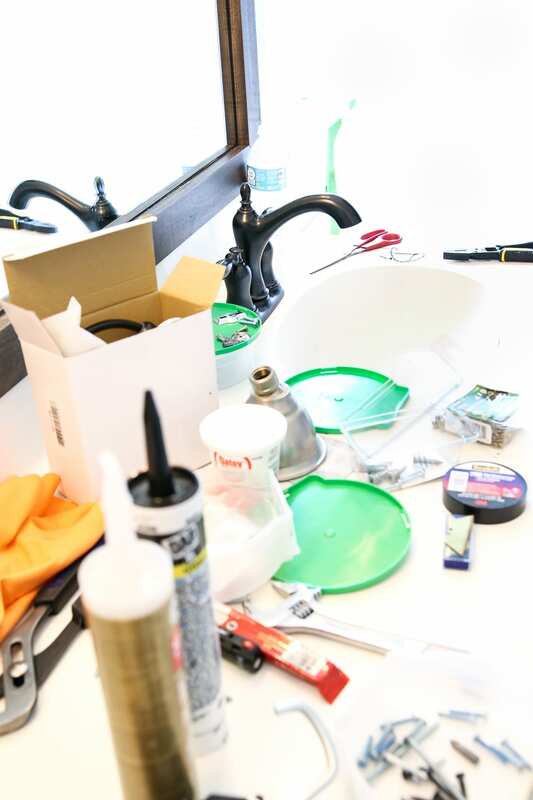 How do you secure the mirror to the wall before adding the stained wood trim? 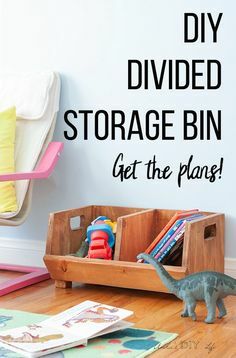 I have wanted to do this at my house, but did not know how. My mirror has clear plastic cheap-o things with a screw in them to hold the mirror to the wall. Would appreciate any suggestions. Thanks! This mirror was stuck to the wall with adhesive, so we used Liquid Nails to attach the wood. For clips though, you can route out the places for those and then adhere with the Liquid Nails. The bathroom turned out great! I love the color choices. Especially the vanity. Well done to everyone! It all looks amazing! What a lucky couple to have y’all re-do their bathroom, I know they must be thrilled. Now I’m gonna go examine my bathroom and see what changes I can make…he he. Stunning – had to jump back and forth through the before and after to make sure it was the same room. absolutely beautiful and I plan on utilizing some of you changes. Brilliant work by all involved. Thank you. Great job! Love this bathroom! Just wondering about the shower door. Is that a stock item or is it special order? Also, how much did it cost to replace? Stunning! I’m planning to replace our bathroom fixtures with oil rubbed bronze too. 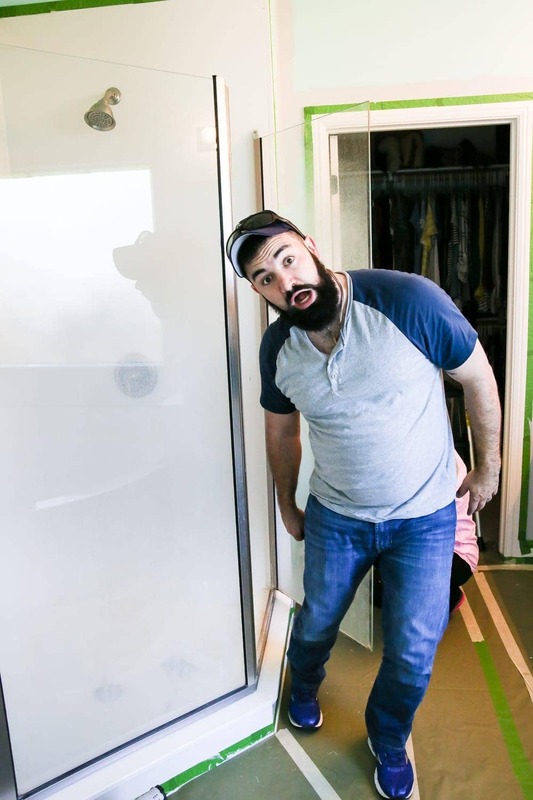 Can you share how you painted the floor grout? I love that idea. You guys have done such a great job, especially with the small turn around time! You guys make a great team together! What a beautiful transformation. I love the colors you chose for the cabinets and walls. I hope you painted the cabinets with a coat of oil based primer before painting them with latex paint. If you didn’t, the paint will not adhere to the cabinets. Beautiful job !! But have to admit – a little disappointed in the choice for the makeover. 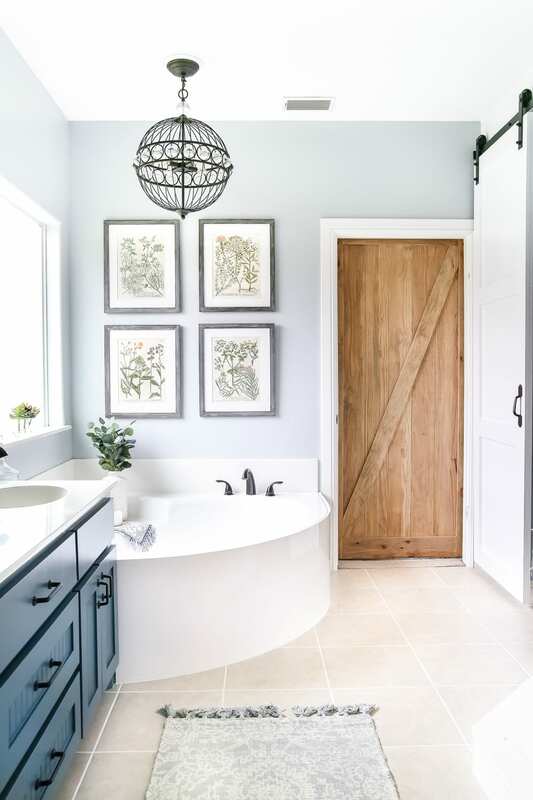 This bathroom was pretty nice to begin with – not outdated, dingy, dysfunctional or old. Personally I would of been happier for someone who was really in need of some help to have benefitted from this fabulous contest. But maybe next time. So beautiful! Can you tell me where you got the flowers and vase that sit on the middle of the vanity? Thank you! 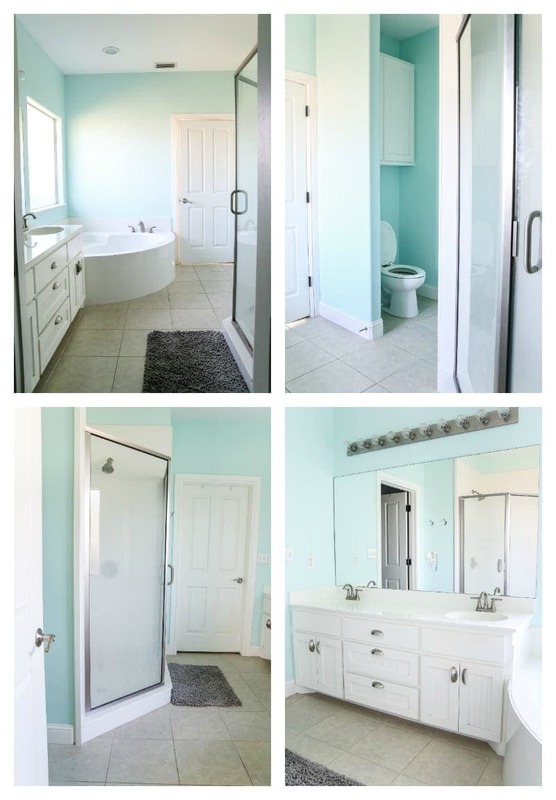 Love all the color choices and accents and have been inspired to redo my bathroom! 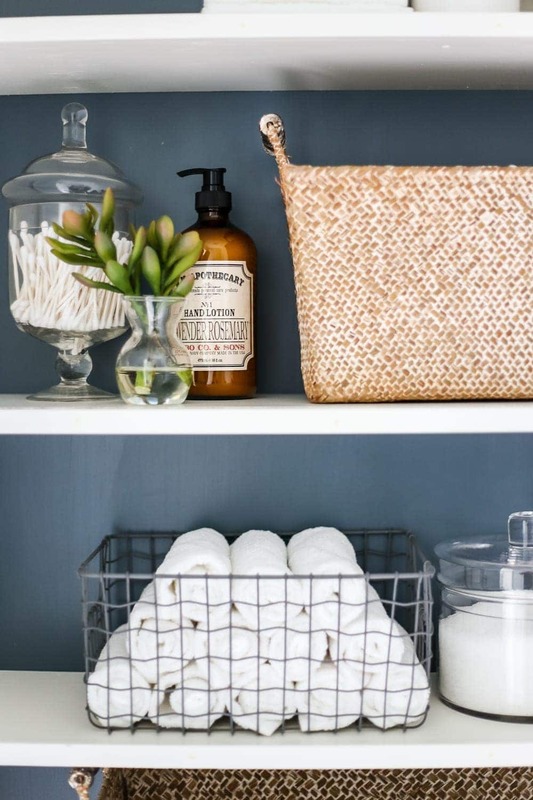 Love the idea of changing the grout color…who knew!! Paint store here I come to get these colors!!! Thanks for the pics and the great breakdown. I love the shape of the shower. Who makes the door? Great job. Love Lowes and your selections. I have an outdated bath AND I have that same Hollywood light bar. How did you get 2 light fixtures up? Were there 2 junctions under the bar? I’ve wanted to replace mine but assumed I would have to hire an electrician to modify and that’s not in my budget. Thanks, Kathie! That Hollywood light bar was actually a surprise. When we took it down, we expected to only have 1 junction and instead there were two separate ones. So we had to return the single long vanity light we had planned to put there and replace it with two separate lights they had in stock at the local Lowe’s. 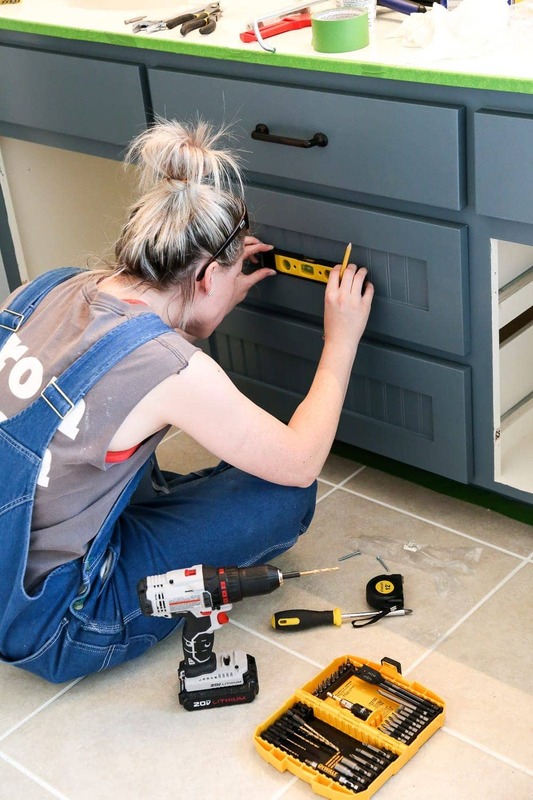 Do you have a tutorial on the painting of the cabinets? I would love to see that! 🙂 Thanks for sharing the pics. It is lovely!!!!! 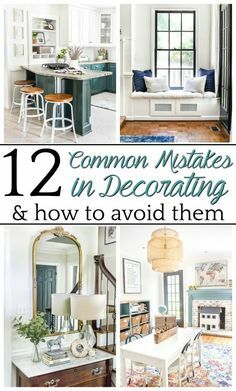 Not these cabinets, in particular, but here is a post that I shared about our method for painting our kitchen cabinets using the same steps: https://www.blesserhouse.com/2016/06/paint-kitchen-cabinets-like-pro.html Hoping that helps! Everything looks Perfect!! Where are your towels from?? Thanks! The towels came from World Market. Where did you get the stone crock that sits on the counter? I’ve been looking for one but not having luck. Beautiful bathroom. Nice job! I believe it came from Hobby Lobby. Hello! 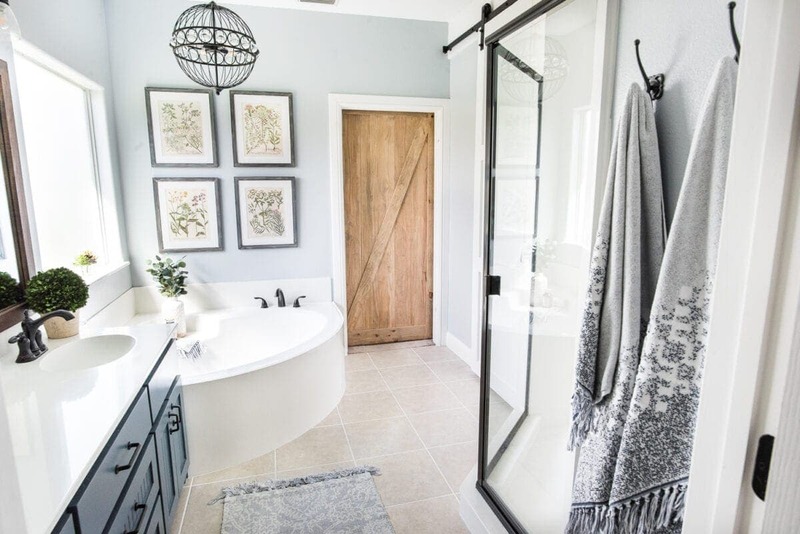 Absolutely love the look of this bathroom! Can you tell me what size this vanity is? Thanks! Hi Kendra! Thank you! Oh, I wish I knew. But we didn’t measure, and since this isn’t our house, I don’t have a way of measuring it. What a transformation! So beautiful! Are the shower doors from Lowes? Stunning! You never stop my mouth from dropping to the floor because of your fabulous work. 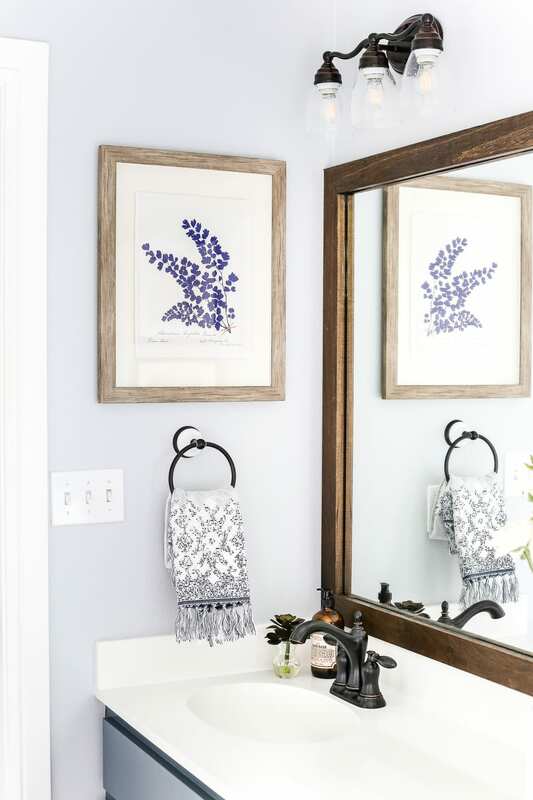 I am so in love with everything about this bathroom makeover. I love this bathroom! 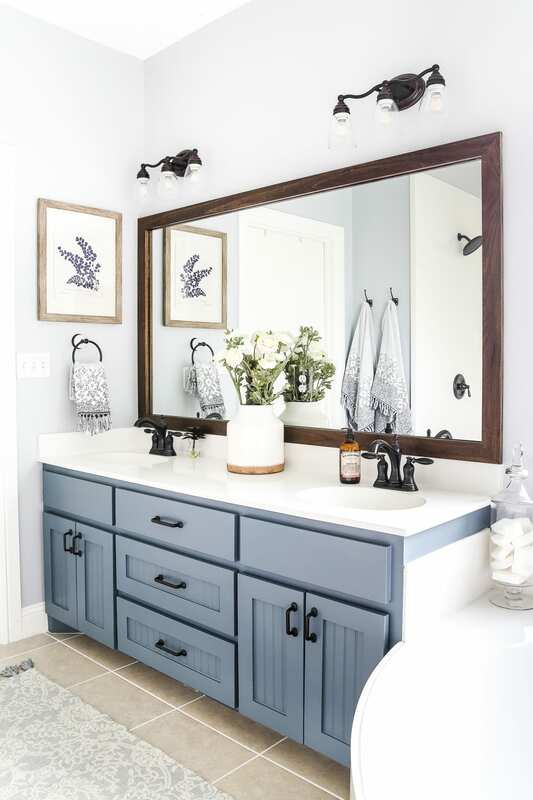 This is the inspiration for our master bath update. 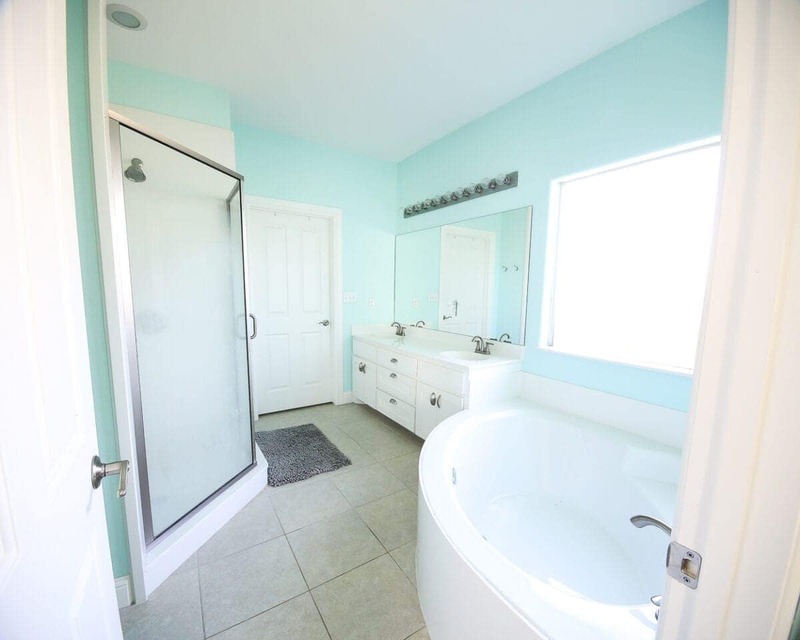 I need a basket (for bubble bath, epsom salt, etc) that sits in the corner “counter” of the whirlpool tub… any suggestions? 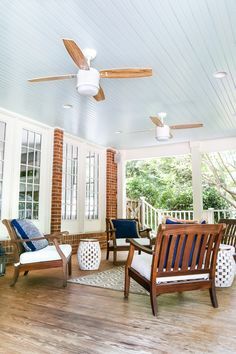 I’m nervous about metal that it would rust with the moisture, and I’m nervous about a woven wood that it would get mildew? There are many plastic options of course but they don’t exactly look right with the rest of the room. 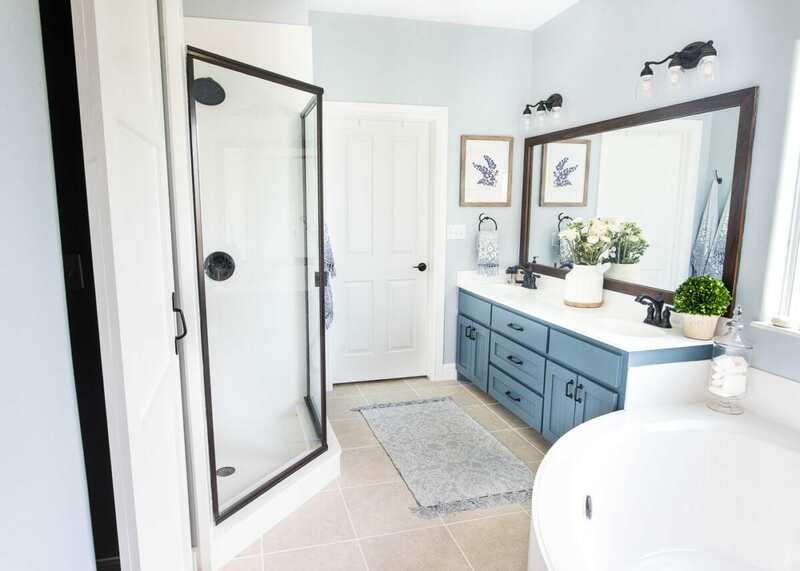 This bathroom turned out amazing! I was wondering if you used the Gray Screen and Slate Tile paint at full strength or were they lightened at all?